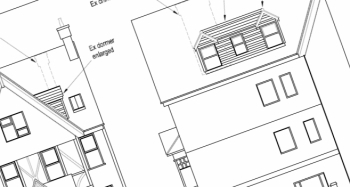 Approved: new dormer window to top floor flat in Bournemouth – No job too small! Bournemouth Borough Council: Pure Town Planning have recently secured planning permission for alterations and formation of a replacement dormer window to third floor flat. The applicant approached Pure Town Planning wanting to find a way to turn a studio flat into a one bedroom flat without drastically altering the visual appearance of the property, which would make securing planning permission for the proposal tougher. Interestingly if a scheme such as this (barring a few caveats) was on a house, proposals such as this would fall most likely under the householders permitted development rights. The reason for this is flats do not have the same range of permitted development rights that houses benefit from, so in most cases even minor material changes such as a dormer window, a small extension/conservatory, fitting new windows (double glazed) etc could all potentially require planning permission. Therefore, if you are thinking of making some small changes to your flat or want to know exactly what your permitted development rights are on your house why not get into contact with Pure Town Planning for a FREE 30-minute consultation and find out how we can assist and advice you on your proposal.